Residential Generators Newington Electric Co. The next time you lose power, turn it back on with a home generator system installed and wired by Newington Electric. Residential generator systems are available in two types: fully automatic and manual electric start portables. They both primarily do the same thing with the exception that the fully automatic is just that...it's fully automatic. When the power goes out the unit automatically starts and the generator restores the power to your home automatically. The electric start portable works similarly with the exception that when the power goes out someone needs to start the generator and manually turn on the transfer switch. The automatic standby units are available in natural gas or propane. The portables are available in gas only. Home Generator Systems can prove to be a lifesaver when the power goes out. Generators are becoming a popular investment with homeowners who don't want to be left in the dark. A generator can efficiently supply power to your entire home or business to run your lights. furnace, refrigerator, electric range, security system, computer, TV, well pump, sump pump or whatever else is important to you. Whether you choose a Standby unit or a Portable unit, a generator can provide you with enough power to sustain a prolonged power outage in the heat of the summer, or in the cold winter months. These units not only offer comfort and security, they also provide peace of mind and completely eliminate the loss of electricity. Home generators provide complete insurance during power outages. More and more homeowners are relying on home generators to supply power to their homes during a power outage. 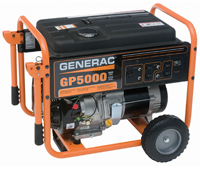 Home generators are available in two styles, Standby and Portable. They are both wired into your home using YOUR EXISTING WIRING SYSTEM, ELIMINATING THE NEED TO INSTALL NEW WIRING. Standby generators are completely automatic and will restore your power within seconds of a power failure. These units are located outside the home and resemble a central air conditioning unit. 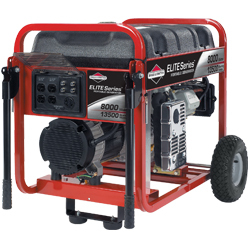 Portable generators are manually operated and are available in electric start or pull start. Portable units can be stored in a garage, shed or in the basement until they are needed. Home generators are affordable and easy to use. The average cost of a typical portable unit installed and wired, including the generator, will range in price from $1,500.00 to $3,900.00 depending on the wattage you choose. A totally automatic unit will run approximately $4,800 to $8,500. Typical install includes a 7kW to 10kW Guardian Generac Generator. If you have ever lost your power, you will agree that this is money well spent. The peace of mind alone, in knowing that you can restore your power and secure your home, is well worth the investment! Insist that your electrician take out an electrical permit to install and wire your generator (Portable or Standby) and have it inspected by your local electrical inspector. Make sure that your electrician is and will be available to you after the installation if you need assistance or have questions regarding the operation of you generator. Automatically starts and immediately restores the power to your home. Someone needs to start the generator and manually turn on the transfer switch. Gas vs. Propane Available in natural gas or propane. Gasoline only. Average cost of a typical unit installed and wired with transfer switch. From $4,800 to $8,500 which includes a 7kW to 10kW Guardian Generac Generator. Gas or propane hookup included. From $1,500.00 to $3,900.00 which includes 3500 watt to 7500 watt. Lead time Generators are in stock, installation lead time is approx. 2 weeks. Generators are in stock, installation lead time is approx. 2 weeks. Installation time Typical turn-key installation requires 2 men, approximately 1 day. Typical turn-key installation requires 2 men, approximately half a day. If you choose to buy your generator from a home center, NEC will be more than happy to provide you with a price to install and wire your system including the natural gas or propane piping required to run your generator.